Welcome, veterans! If you have any questions regarding your benefits, your eligibility, or the status of your benefits please call, email, or come by the Financial Aid/Veterans Affairs office in the Swatara Building. A veteran's benefits are determined by the guidelines of various programs, typically named after a chapter of Title 38 of the United States Code. Offers up to 100% for tuition, plus a monthly housing allowance paid directly to the Veteran, $500 a semester for books, and the option to transfer benefits to family members. Chapter 30 offers benefits for veterans attending school. Chapter 30 pays $1321 per month to a full time student, tiered at lower rates for less than full time students. Chapter 31 is a vocational rehabilitation program that serves service-connected disabled veterans with education benefits. CH 35 provides education opportunities to eligible dependents of veterans. The program offers up to 45 months of education benefits. REAP is available to all reservists who, after 9-11-2001, completed 90 days of active duty service. Veterans have been granted priority registration by Penn State, meaning that they may schedule classes ahead of students without priority registration based on the timeline set by each campus. Check with the Office of the Registrar to determine the applicable registration dates. Refer to the Priority Registration Page for full details and instructions. The official written notice from the Department of Veterans Affairs to a student of his or her monthly rate of payment, the inclusive dates of payment, delimiting date, and remaining entitlement at the end of the award period. An award letter is sent to a VA student whenever VA awards or changes the student’s education benefit. The Certificate of Release or Discharge from Active Duty that is prepared at the time an individual completes a period of active duty in one of the Armed Forces. Veterans should be advised to submit copy member 4 of their DD 214 with a claim for VA benefits. A certified copy may also be submitted. The first day after a claimant’s period of eligibility expires. Benefits are not payable on or after the delimiting date. Generally, the delimiting date is ten years and one day from the veteran’s last release from active duty date (RAD). Chapter 1606 is ten years from the date of eligibility if eligibility was established before October 1, 1992 and fourteen years after October 1, 1992. The expiration date for those under Chapters 35 is computed differently. Delimiting dates can be extended for those who were ordered to active duty as a member of the Selected Reserves or National Guard. The Social Security Number (SSN) is the VA file number for most veterans. If a veteran was assigned an old seven or eight digit file number, the veteran’s SSN will cross reference the seven or eight digit file number. A dependent’s SSN will not cross–reference a veteran’s record. To access a dependent’s record, the file number of the veteran must be provided. Additional money added to an individual’s education fund by the Department of Defense to encourage enlistment or retention in the Armed Forces. The kicker is added to the individual’s normal education benefit. Kickers are used for chapters 30 and 1606. Individuals who become eligible for Chapter 1607 may receive kickers from their former benefit. 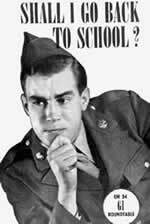 Members of the Selected Reserve are given a Notice of Basic Eligibility (DD Form 2384, commonly referred to as a NOBE, pronounced no-be) by their National Guard or Reserve unit stating they are eligible for the Montgomery GI Bill®–Selected Reserve (Chapter 1606). The primary source VA uses to establish chapter 1606 eligibility is a Department of Defense (DOD) computer link, the chapter 1606 DOD Data Record. The NOBE is an alternative or supplemental document for establishing eligibility that’s primarily used to verify eligibility for 120 days after the date it’s issued. WAVE is an Internet program used by Chapter 30 and 1606 students to verify their enrollment. Verification is required monthly. Students can also use WAVE to change their address and direct deposit information.